iss050e059620 (03/24/2017) --- Expedition 50 Commander Shane Kimbrough of NASA is seen floating into the Quest airlock at the conclusion of a spacewalk. 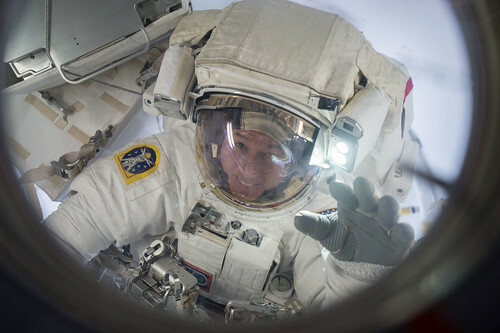 Kimbrough and Flight Engineer Thomas Pesquet of ESA (European Space Agency) conducted a six hour and 34 minute spacewalk on March 24, 2017. The two astronauts successfully disconnected cables and electrical connections on the Pressurized Mating Adapter-3 to prepare for its robotic move, lubricated the latching end effector on the Special Purpose Dexterous Manipulator "extension" for the Canadarm2 robotic arm, inspected a radiator valve and replaced cameras on the Japanese segment of the outpost.